The National Multiple Sclerosis Society (US) describes the disease as a chronic, often disabling disease that attacks the central nervous system (CNS), which is made up of the brain, spinal cord, and optic nerves. Symptoms differ in individuals and may be mild, such as numbness in the limbs, or severe, such as paralysis or loss of vision. 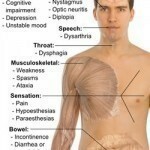 The progress, severity, and specific symptoms of MS are unpredictable. Autoimmune diseases arise from an overactive immune response of the body against substances and tissues normally present in the body which means the body attacks its own cells. MS is considered an autoimmune disease as it occurs when the body’s own defense system attacks myelin, the fatty substance that surrounds and protects the nerve fibers in the central nervous system. The damaged myelin forms scar tissue (sclerosis). 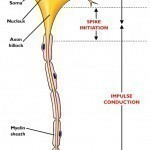 Impairment of any part of the myelin sheath or nerve fiber distorts the nerve impulses traveling to and from the brain and spinal cord which causes a number of symptoms. Persons with multiple sclerosis are usually able to have a normal life or close to normal as most are not severely disabled by the disease. A definite cause for MS has not been identified; however, researchers believe that a combination of factors may be involved. MS involves an autoimmune process. The exact antigen, or target that the immune cells are sensitized to attack, remains unknown although other information has been discovered such as which immune cells are attacking and the cause of the attack and some of the sites, or receptors, on the attacking cells that appear to be attracted to the myelin to begin the destructive process. It is thought that geography may be a factor in the cause of MS as scientists reveal that it occurs more frequently in areas that are farther from the equator. Variations in demographics, genetics, infectious causes, and migration patterns, are being researched to find out the reason for the connection. One deduction is that it may be related to the Vitamin D levels found in persons that live closer to the equator as opposed to persons that receive less sunlight. Naturally-produced vitamin D is thought to have a beneficial impact on immune function and may help protect against autoimmune diseases like MS. The National MS Society states that several viruses and bacteria, including measles, canine distemper, human herpes virus-6, Epstein-Barr, and Chlamydia pneumonia have been or are being investigated to determine if they are involved in the development of MS, but none have been definitively proven to trigger MS. Though MS is not thought of as being hereditary common genetic factors have been found in some families where there is more than one person with MS. In family history, immediate family members such as sibling and parents will have a greater risk of developing MS. Other theories state that MS develops because a person is born with a genetic tendency to react to some environmental agent that, upon exposure, triggers an autoimmune response.